This is the first Dutch edition of The Dark Wind. It is the fifth Navajo mystery novel by Tony Hillerman. This edition was published by Utigeverij BZZTôH in 1992 in 's-Gravenhage (Hague in English) in the Netherlands. 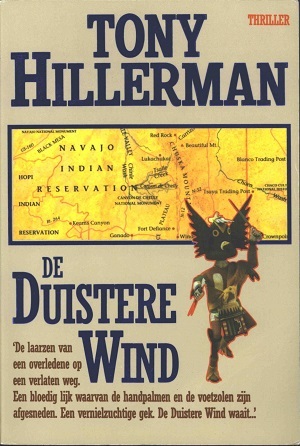 The text was translated from Tony Hillerman's original English text into Dutch by Wiebe Buddingh'. The cover was designed by Julie Bergen and depicts a map of the Navajo Reservation. Below is the cutout of a Crow Kachina photograph which was taken from Tony Hillerman's Hillerman Country. A theme in this novel is the tension between Navajo and Hopi over their joint-use land and the Crow Kachina on the cover ties into this theme because it is one of deities in Hopi religion. Format: Paperback, 20.1 x 1.5 cm. Binding: Paper covers with a full-color graphic cover, and author, title, and publisher vertically printed in blue brown, and black on the spine.